Clock-makers in this region have been making precision clocks ranked among the best. Many clock-makers claim to have invented the original cuckoo clock, but the credit officially goes to Franz Anton Ketterer in the mid 17th century. Cuckoo clocks are distinguished by their expert designs and the famous cuckoo bird that appears to announce the time. The clocks are typically designed to depict scenes of family, work, nature, or the military. Intricate wood carving, colorful painting, and precise time keeping set Black Forest cuckoo clocks apart. Decades ago, cuckoo clocks were a major production in Germany, but during the World Wars, most factories were shut down. A few have remained and they continue to produce the highest-quality clocks right from where the cuckoo clock originated. There's nothing quite like the original. The region's famed clock-makers' expert experience over a century helped create this timeless clock. If you know anything about cuckoo clocks, then chances are you've heard them linked with the Black Forest region of Germany. These curious clocks have been popular for centuries and continue to be purchased as antiques or souvenirs today. We love cuckoo clocks and the rich heritage they represent. Enjoy three things you probably didn't know about Black Forest Cuckoo Clocks. Cuckoo clocks are strongly associated with the Black Forest region of Germany, so many people believe that this is where they originated. A primitive cuckoo clock dates much further back, however. The first cuckoo clock is credited to the Greek mathematician Ctesibus, who lived in Alexandria around 250 BC. He had a clock that used water that would set of a whistle and make a model owl move on the hour. There are accounts of other clocks through history that used birds to announce the hour from the Middle East to Europe. It wasn't until the 1600s that the modern cuckoo clock was developed, but it wasn't developed in the Black Forest. However, it was soon a popular production piece there and the clock-makers in the Black Forest region transformed the clock design into what you know today as the cuckoo clock. Many people aren't interested in getting a cuckoo clock because they are worried that it will drive them nuts. Who wants a little wooden bird chirping at them all night long? Lucky for you, there are many different styles of cuckoo clocks and many have different mechanisms that can turn off the sound. Some cuckoo clocks have switches that you can flip before you go to bed at night that will make the clock silent. For more modern quartz clocks, there is a light sensor, so the clock won't sound when it's dark or you can set it not to go off at certain hours. A 1- or 8-Day German Cuckoo Clock? What better way to keep time in your home than with a charming cuckoo clock? Decades ago, pendulum clocks like cuckoo clocks were the standard everywhere. As technology developed, the pendulum clock was surpassed in precision of time keeping. The pendulum clock was displaced as the keeper of time for businesses, governments, and many homes. Pendulum clocks are still totally sufficient for a clock in a home. Cuckoo clocks particularly add great classic style and charm to your home. They come in a variety of designs and can be made from any number of kinds of wood. They can be either painted or simply stained. We have clocks made with quartz that run on batteries but have the look of the traditional cuckoo clock. This can be a fun and more accurate way to keep time. However, there is something special about traditional cuckoo clocks that are made entirely of wood, except the movements. There are several different kinds of traditional cuckoo clocks to choose from, including the 1-day and 8-day clocks we sell. Consider the following information when deciding between a 1-day and 8-day clock. Who Has Quality Cuckoo Clocks for Sale? If you have ever had a cuckoo clock, or remember one from your childhood, it is likely that it brought a smile to your face. There is a good chance that you would stand by the clock anxiously waiting for the bird to come out and sing. Twelve o'clock was probably a favorite, because it gave you the chance to really enjoy the show. Are Quality Cuckoo Clocks Affordable? Often when you think of a cuckoo clock, you probably think they are very expensive. A lot of clocks are made in Germany and there is quite a bit of detailed carving. Cuckoo clocks generally are in a chalet style that looks like a small house. They are covered with carvings of animals, birds, and leaves. It is true that some of these works of art can be valuable. We focus on having affordable cuckoo clocks for sale. We want you to have the clock that fits into your budget, as well as giving you the opportunity to choose one that you like. We offer a large variety of clocks that are more affordable but don't lack in quality and craftsmanship. What Should You Consider When Choosing Your Clock? Each cuckoo clock needs to be wound, so to speak. The movements of the hands of the clock are weight driven by chains that emerge from the bottom of the structure. These need to be reset regularly to keep the time piece working. You can purchase a one-day or eight-day clock based upon how often you want to do this. You will want to consider your schedule and routine when deciding which is best for you. There are also many styles that you can choose from on our website. You may even want a musical clock which will also play music on the hour after the cuckoo emerges.We offer several different cuckoo clocks in our store to meet any need and budget. Cuckoo clocks have long been loved for their style and charm, in addition to being useful timepieces. Cuckoo clocks have a rich history dating back hundreds of years. A traditional cuckoo clock is typically pendulum-driven and strikes the hours using tiny bellows and whistles that mimic the call of the Common Cuckoo. A small gong is also struck on the hour. The mechanism used to make the cuckoo clock has remained virtually unchanged across the centuries. Cuckoo clocks are a great example of quality and getting it right the first time! There are many accounts of how the cuckoo clock came to be, but this much we do know: the cuckoo clocks we know and love today were largely designed and developed in the Black Forest region of Germany. This wooded region was the central place for woodworking and craftsmanship. Cuckoo clocks are little pieces of history and culture. You'll love having a charming cuckoo clock in your home to announce the hour. When trying to choose a cuckoo clock, there are five main types to consider. The idea of the cuckoo clock has largely remained the same, despite advances in technology. A little bird or figurine pops out and moves in time with a tune, whether that tune is made by a little pipe organ, a musical comb, or a digital speaker. Modern clocks strive to meet the classic nature of the Black Forest clocks while still displaying advances in clock-making technology. The cuckoo clock is still renowned the world over; people collect old clocks or build new ones, but everyone knows and loves seeing a cuckoo clock in action. Even in a day where we can find a clock in almost every pocket (cell phones), there will always be a need for a clock in your home. But finding the right clock for your home is an important decision. Cuckoo clocks are an excellent choice for many reasons; however, here are the three most important reasons for buying a cuckoo clock. Sure, it's easy to find a clock in any store that will do its job: tell the time. However, a cuckoo clock is a beautiful work of art that will add incredible beauty to your home. Our Black Forest clocks, which are imported from Germany, come in numerous sizes and styles. The detail in each of these clocks is breathtaking, and you are sure to find a style that fits your tastes and interests. As mentioned, we carry clocks in many sizes and styles, from smaller clocks to grandfather clocks. But you may be surprised to learn that not all cuckoo clocks are the traditional leaves and birds style. We carry a wide variety, including clocks that feature animals or wildlife, band musicians, hunting and fishing themes, and more whimsical styles such as kissing lovers, beer drinkers, and more. So whether you prefer the traditional look of leaves and birds or some other style, you're sure to find what you're looking for. A cuckoo clock, while being functional by keeping the time well, is also a fun addition for any home. Kids and adults alike will enjoy hearing and seeing the hourly reminders of the time as well as the additional animation that may be part of your clock. These clocks are not only excellent at keeping time, but they become an important heirloom that can be passed throughout generations because of the excellent craftsmanship and quality of our cuckoo clocks. If you've been shopping around for a Black Forest cuckoo clock, you've probably noticed that we carry a wide selection of these clocks of different sizes and styles. While you've undoubtedly noticed that these clocks are intricately beautiful, you may have wondered about the history behind these exquisite timepieces. Once you know the history behind these clocks, you are sure to appreciate these works of art even more. Prior to cuckoo clocks and other timepieces, time was usually kept using sundials or hourglasses. This was true until the mid-1600s. Fortunately, a German traveler who had recently returned from Czechoslovakia brought a crude "wood beam" mechanical clock to Germany. This clock used gears and weights and was a substantial improvement in the way people kept track of time. People living in the Black Forest soon began to make clocks as a way to pass the cold, harsh winters, as well as for a source of income. Some European cities had begun making clocks called artist clocks, which had moving figures. Some of these had a crowing rooster at the top of each hour. It is thought that perhaps this was the inspiration for Franz Anton Ketterer, who is attributed for making the first true cuckoo clock. The sounds of the rooster, and then the cuckoo were made using a mechanism with bellows that sent air through small pipes to make the "cuckoo" sound. Ketterer is credited with creating the first cuckoo clock because he not only carved the cuckoo bird, but he also perfected the sound of the cuckoo. In addition, he improved the mechanization of the gear wheels and stone weights that allowed the clock to run properly. Because the Black Forest region could have such long, cold winters, clock making soon became a popular pastime and flourishing industry. Clock makers could spend hours working on and perfecting not only the carvings on the clocks, but the actual workings inside. In fact, people soon began to specialize in different aspects of clock making. There were specialists in gears, carving, cases, painting, and more. The industry became so important that a school was founded to teach mathematics, case-making, mechanical engineering, drawing, and other aspects of clock making. This training and expertise is what has produced the beautiful Black Forest clocks that we continue to sell with pride, and which owners will continue to treasure for years to come. Although choosing the perfect timepiece for your home may not seem like a big deal, it's a decision that shouldn't be taken lightly. When you think about it, what other decoration in your home (besides a mirror) do you look at as often as you do your clock? You want something unique and beautiful that is also functional and keeps the time well. All of these factors make a German cuckoo clock an excellent choice for your home. Here are five reasons why you should choose a Black Forest German cuckoo clock as your home's main timepiece. It goes without saying that our German-imported cuckoo clocks are beautiful. The intricate designs on the numerous clocks we carry are astounding indeed. Not many other types of clocks include such detail and craftsmanship. While beauty is in the eye of the beholder, the numerous styles of cuckoo clocks to choose from ensure that you will be able to find a clock that will only add to the beauty of the room it adorns. 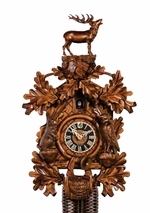 In addition to being beautiful, our Black Forest cuckoo clocks are unique as well. There are literally dozens of styles and designs to choose from. There are numerous styles that can reflect your interests and personality, from traditional leaf and bird styles, to hunter, beer drinker, fisherman, and kissing lover scenes. Few other types of timepieces are able to reflect your personal tastes as well as these clocks. Cuckoo clocks are known for keeping time well, especially when wound appropriately. You can choose a clock that is wound daily or every eight days. Clock winding is very simple and only requires the weights to be pulled back up near the clock before they have dropped all the way down. Some clocks are battery powered, requiring no winding. If you are worried that the noise will keep you awake at night, there are many clocks that have the option of turning off the cuckoo sound at night. Some even turn off automatically when the room is dark. It can be extremely helpful to own a clock that gives auditory reminders when the hour changes. This can help you to better keep track of time, but it is also fun for children and adults alike. In addition, clocks with animation add a degree of fun to your day. This animation can be anywhere from simple to extremely detailed and intricate. Some clocks even have the option of a cuckoo sound more often than just the top of each hour. If you purchase one of our German cuckoo clocks, which have been certified for authenticity by the Association of Black Forest Clocks, you can be sure your investment will last for years to come. These clocks are made by individuals who have been trained in a tradition centuries old. These high-quality timepieces are sure to last for years, providing you the opportunity to pass down your clock so that it may be enjoyed by future generations. Cuckoo clocks have been around for centuries; the first description of one goes all the way back to 1629. By the middle of the eighteenth century, they were becoming increasingly popular in the Black Forest region of Germany. It didn�t take long before they dominated the region, which remains the center of cuckoo clock making even today. Despite the many years that have passed since cuckoo clocks were invented, they are still made in much the same way as they were hundreds of years ago. For instance, the mechanism that creates the cuckoo sound remains largely the same as when it was invented. The outer appearance of the clock has evolved to reflect changing styles, but the inner workings have remained constant. Because cuckoo clocks were invented long before batteries or electricity, their creators needed another way to keep them running. This is where the pendulum comes into play. The pendulum swings back and forth at an steady rate, marking off time and gradually counting down to the exact time when the cuckoo call sounds. The clocks must be wound every day or once a week, depending on their size and design. Clockmakers have been able to do some amazing things with cuckoo clocks over the years. The traditional style features a bird popping out of the clock, but this is far from the only design. You can find clocks that include entire scenes of activity, or ones that play musical tunes along with the traditional cuckoo sound. And all of this is done without the help of electricity!